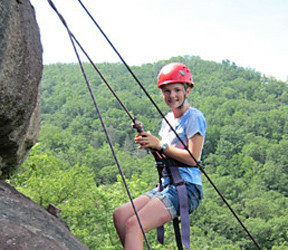 At Rockbrook every girl can look forward to excellent hiking camp activity whether it be taking a short trip through the forests of Rockbrook itself, or visiting one of the many nearby waterfalls. Hiking through the woods, and camping, there's a real feeling of immersion in nature. 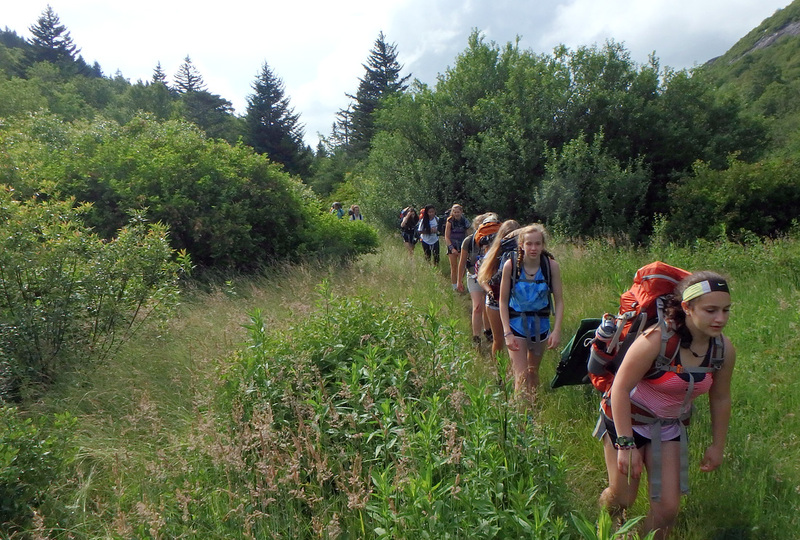 A highlight of the older girls is the overnight trips that include hiking and backpacking. 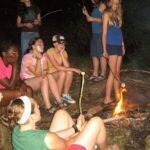 These trips take girls into the back country for campfires, amazing views, and plenty of camaraderie. 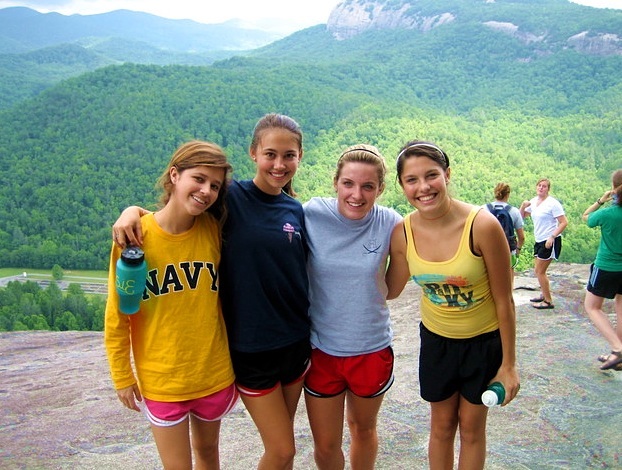 Girls have hiked these hills since the very first year of camp! 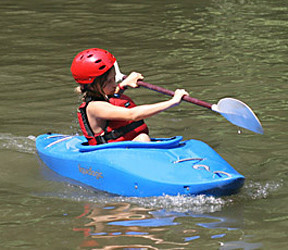 Every week at Rockbrook, we offer adventure trips out of camp where the girls can hike, swim, paddle or climb in the nearby National or State forests. 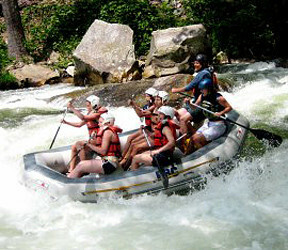 These trips are always optional; like all the activity offerings here, the girls themselves select whichever they like. 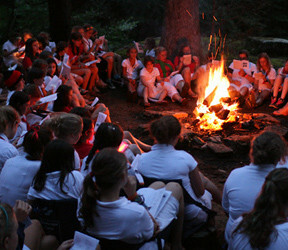 Often how they select involves considering who among their friends will also be signing up, what they’ll be missing when out of camp, and sometimes a consideration of what seems new and interesting. Today a group of girls returned from a backpacking trip through a high elevation area in the Pisgah Forest. Clyde and Jane led the trip that included visiting a waterfall on the Flat Laurel Creek and a morning hike to the summit of Sam Knob (elev. 6050 ft). 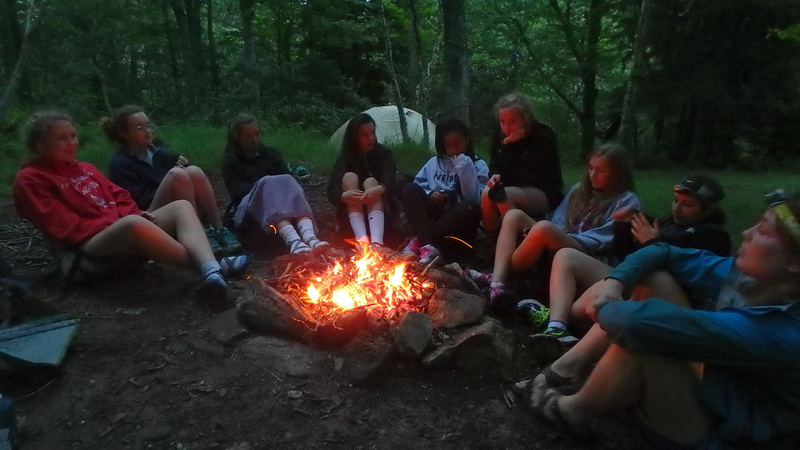 The girls took some time during the trip to reflect and write about their experience, so I thought it would be nice to publish some of their thoughts. When you read what they wrote, it’s clear they really got a lot out of the experience. 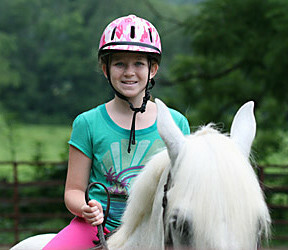 Talley and Jessi took a bunch of Junior campers on a really cool day hike this week. They packed a lunch and drove up to the Blue Ridge Parkway to hike along a section of the Art Loeb trail. 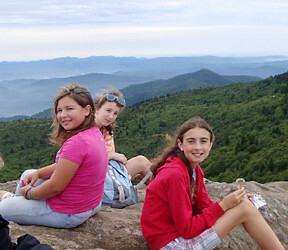 They made it all the way to the top of Black Balsam Knob (6214 ft) and Tennent Mountain (6040 ft)! This is a true “above the clouds” experience, as these are some of the highest peaks east of the Mississippi river. Fortunately, the weather was awesome so the girls could see for miles. 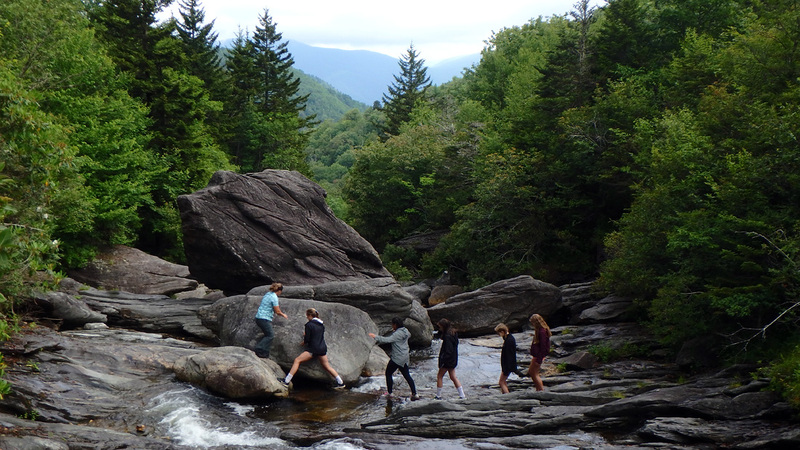 We took the CA campers on a hike to John Rock yesterday. All 20 of them, their 5 counselors, Jessi and Jeff made the mostly uphill hike from the fish hatchery to the rock. It’s a fantastic walk through the woods. Right now the mountain laurels are blooming, so parts of the trail wind you through a tunnel of white and pink flowers. Then at the top it’s a breath-taking view across to Looking Glass Rock (in the background of this photo). We took the hike to discuss what this session’s banquet theme will be. Starting with almost 40 different ideas, these 9th graders slowly narrowed down the list and finally settled on a fantastic idea. 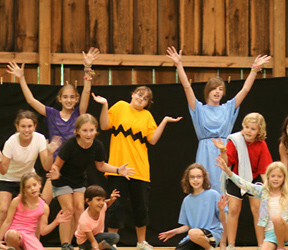 For the rest of the session, they’ll work on decorations, costumes, skits, songs, dances, and a special menu to match their theme. It’s a big event, and a big surprise for everyone else in camp. Let’s not forget hiking! 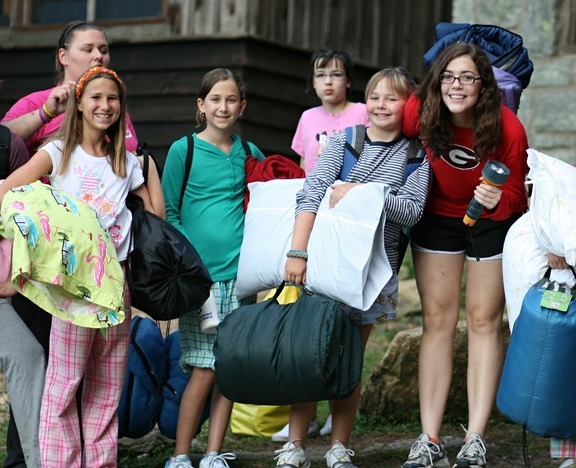 All the girls who come to Rockbrook can count on a hiking and camping adventure. It’s not required or anything, but just about everybody takes a special trip out of camp to spend a night camping out in the forest, either at one of our outposts (at the Nantahala River or nearby camp below Dunns Rock) or in the nearby Pisgah National Forest. 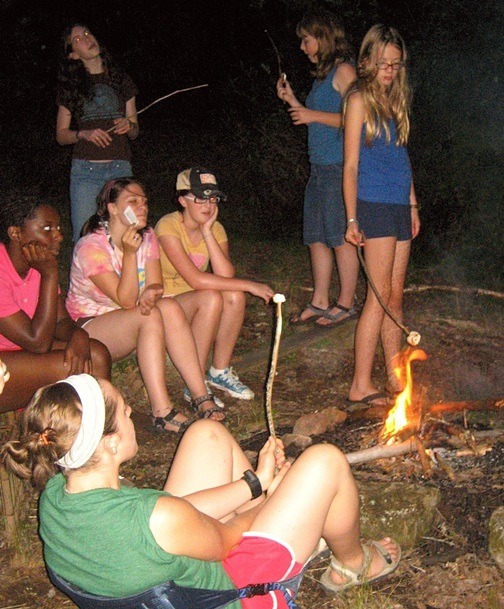 Even the youngest campers look forward to being outdoors, sleeping in their sleeping bag, messing around with their flashlight 🙂 and of course, making s’mores over the campfire. Hiking and camping like this is big fun for the girls, but more than that, it reconnects them with nature. Away from the ordinary distractions of being inside (home, school, car), they settle down and become more aware of the world around them. This makes it easier to appreciate the people around them too, and thereby to make friends. 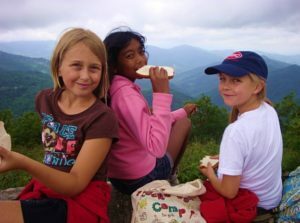 It’s amazing, but hiking and camping provides an almost magical context for girls to enjoy being with each other while at the same time growing socially. Here’s a picture of a hiking group at the top of Castle Rock, one of the two massive rocks on the Rockbrook Camp property (the other one being Dunn’s Rock). From up there, the view is out across the French Broad River Valley and out to the Blue Ridge Mountains. It’s an amazing spot to see Cedar Rock (another climbing destination) and on a clear enough day, Tennent Mountain (a backpacking spot up near the Shining Rock Wilderness area). Sitting at this spot on Castle Rock your elevation is almost 2,450 feet above sea level. Below you is a 150 foot rock cliff and further below is the main part of camp which has an elevation of 2,250 feet. 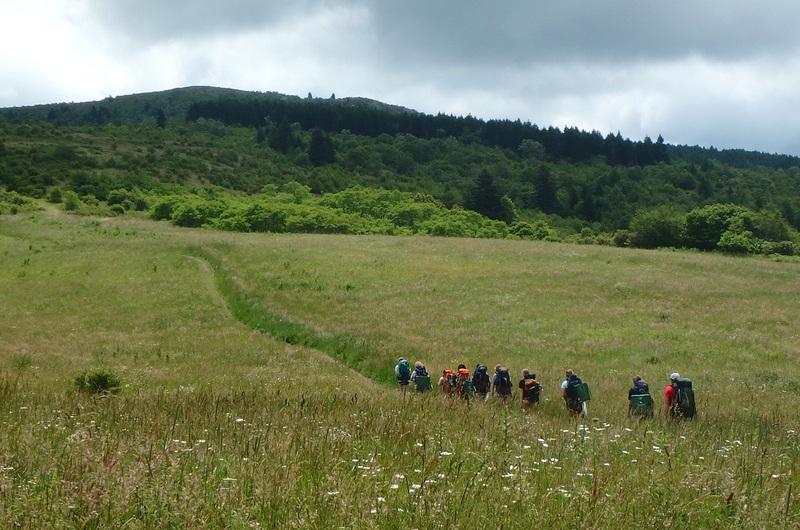 You knew hiking the trail from camp to Castle Rock was steep uphill; now you know how much! You’re hiking up about 200 feet in about half a mile. Here’s a view of Castle Rock from below in camp looking up. 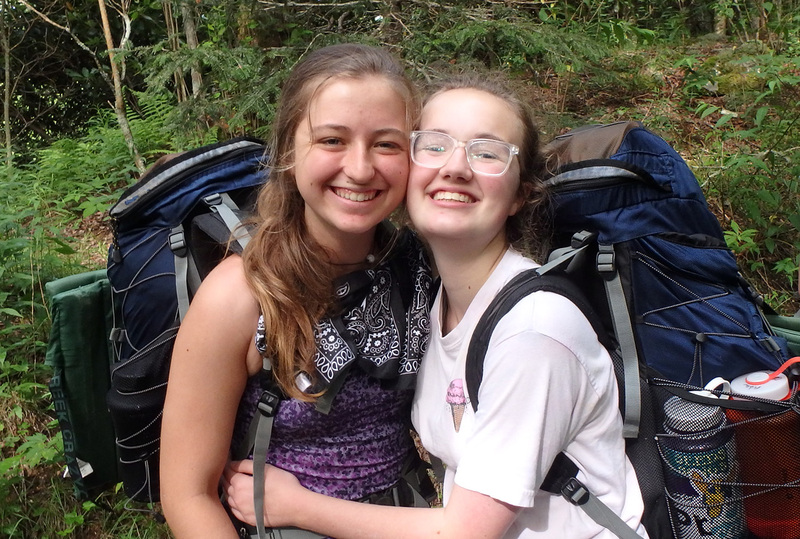 Tonight was birthday night at camp, but a few girls were heading out for an overnight backpacking trip and would have to miss the celebration back at camp. Rather than go without, however, Jessi made arrangements to bring a few party things with the hiking group. 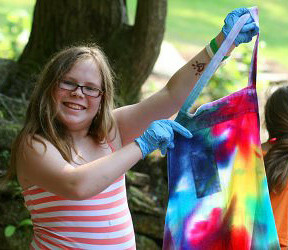 Yep, they had their own birthday party out in the woods, complete with balloons, streamers, and an awesome cake! It was a lot of fun, and a big surprise for everyone. Countdown To Banquet: A Hike! 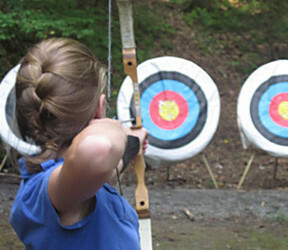 This is usually the most stressful time of the summer for my 15-year-old campers, because as banquet planners a day before the big night, there are usually a million more things to do and a million more reasons to stay up 24 hours straight. Thankfully, we were given a break from all of the intense preparation today. Around 11:00 AM, Jerry approached the CA’s with an idea for a hike, and shortly after, we all loaded on to the buses and headed into Pisgah National Forest. After a vigorous drive over narrow, winding dirt roads, we stopped at a pull-off and commenced our hike. 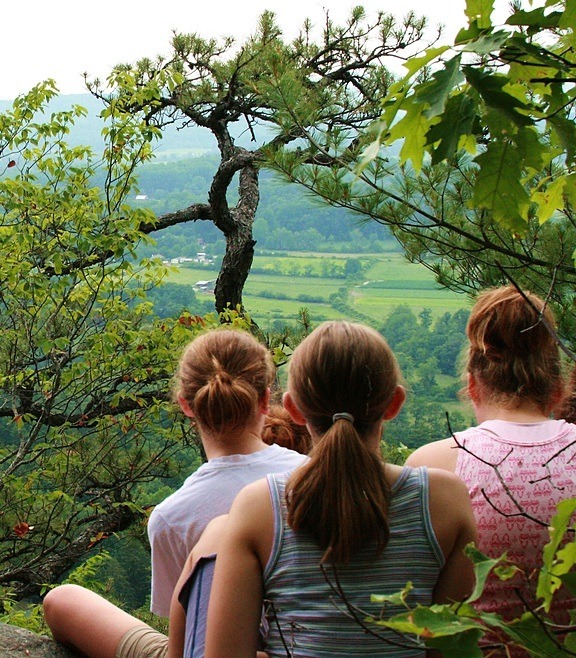 Once we made it to a clearing that had a perfect view of Looking Glass, we had a long talk about what the girls were going through, how they were handling CA responsibilities, and we were able to spend some quality time together and relax away from camp. 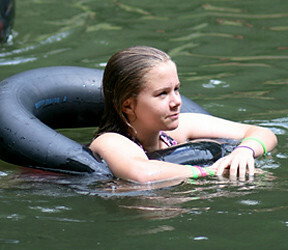 Furthermore, not only did we go for a hike, but we stopped at a swimming hole on the way out of the forest. The drive home was quiet, but I haven’t heard the end of how much fun the girls had today; I can definitely agree when they claim, “this was one of the best days all summer.” Now that they have started moving posters to the dining hall in the stealth of night and actually setting up, all of their careful organization and creativity is falling into place. At this point, all of the CA’s are too excited to sleep, and frankly, so am I! The recent storms have finally passed and Rockbrook is beginning to dry out! 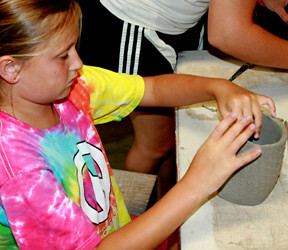 All of our activities are up and running again. One activity, WHOA (wilderness hiking outdoor adventure) is particularly happy to be back in the sun. 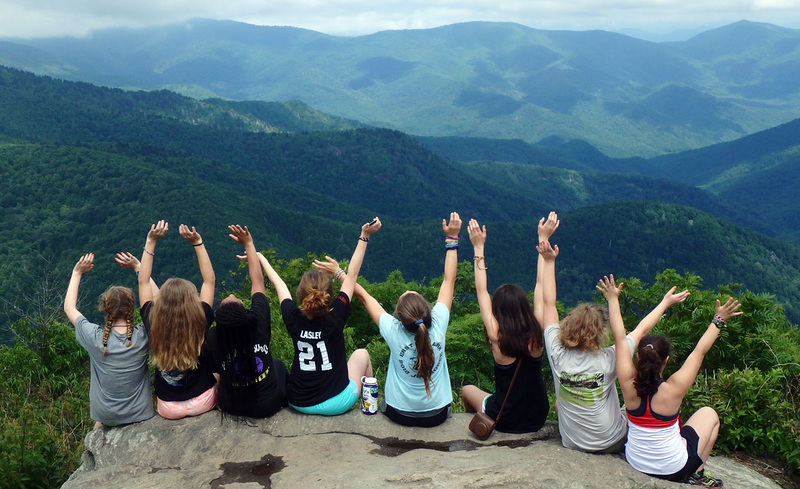 Many girls hiked up to Castle Rock today to enjoy a mountain view of Brevard. I was fortunate to join one very early this morning. The chilly air was invigorating and the steep hike intense, but in the end our perseverance paid off. We found ourselves high up in the clouds with one actually passing right between our mountain and another! 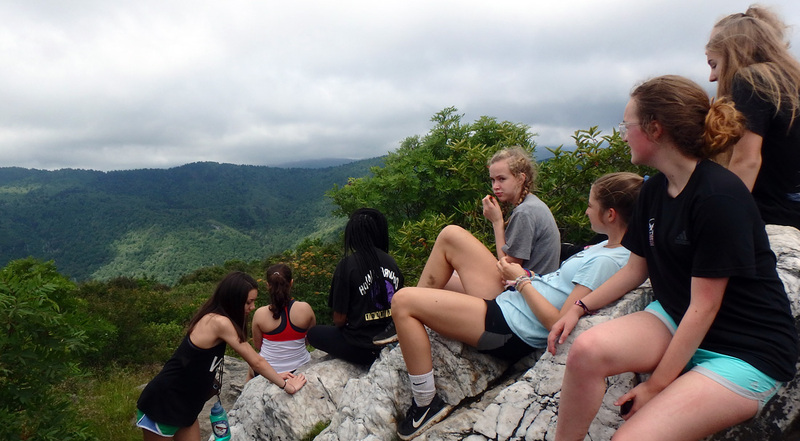 Sitting high up on that rocky ledge gives a whole new perspective to Rockbrook’s location and a deeper appreciation for the wilderness we are so lucky to inhabit for a few short weeks. More amazing adventures to come tomorrow! This is one of those places that almost knocks you over when you see it. It’s a view from the top of John Rock in the Pisgah National Forest (which is right near camp). Hiking through the dense, almost jungle-like, woods for a few miles, being a little sweaty from the climb in elevation, suddenly you pop out to this fantastic view. It’s so surprising and breathtaking. Down almost 1000 feet, you’re looking north toward Looking Glass Rock (one of our camp rock climbing destinations). What a treat! 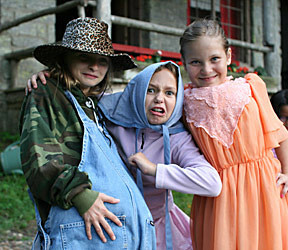 It’s really something to look forward to when you go to a sleep away summer camp in the mountains of North Carolina.